Fucoidan is a complex polysaccharide made up of fucose and other important elements that has the potential to modulate a healthy immune systems as well as increase your body’s overall health and well being. It exists in different kinds of brown seaweed which go through an extraction process, resulting in a powder, pill, or liquid extract. First the seaweed extract is extracted from the seaweed. Then the Fucoidan compound, one of several contituents of the seaweed is isolated from the crude extract. These are the processes by which Fucoidan is obtained and standardized. The extraction process itself varies from producer to producer, but Fucoidan Force®’ uses a gentle and proprietary cold-water extraction process that protects the fucoidan molecule to ensure maximum nutritional benefits. Why is it important to only buy standardized Fucoidan? If you don’t see the word “standardized” on the Supplement Facts label, then you won’t know how much actual fucoidan you are getting. Standardization is the process of determining the exact concentration of a substance in a crude material. For example, 300 mg of crude seaweed such as Undaria pinnatifida and Fucus vesiculosus, standardized to 75% fucoidan, means you get 225 mg of guaranteed fucoidan. During our standardization process, fillers, salts, impurities, and other matter is gently removed from the seaweed through a patented cold water extraction process, leaving the delicate fucoidan molecules in tact to do their incredible work in the body. In this same example, if 300 mg of seaweed was not standardized, all you would know is that you are getting 300 mg of seaweed, and nothing of the actual fucoidan content. What is the nutritional benefit of Fucoidan? 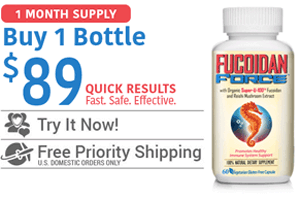 Fucoidan promotes healthy immune function, cell-to-cell communication, and tissue maintenance. Additionally, there are over 1400 scientific articles and publications on the benefits of Fucoidan listed in the National Library of Medicine’s PubMed. How should Fucoidan Force® be taken? Suggested use varies depending on your reason for taking a Fucoidan supplement. Fucoidan naturally occurs in many of the seafood eaten by millions of people of all ages in Japan, China, and Korea. It is used worldwide for fucoidan’s benefits. Please note, fucoidan comes from seaweed which has both iodine and sodium. People with sensitivities to either or who have a preexisting condition should consult a physician before starting any new medication or herbal supplement regimen. Is Fucoidan Force® free from Pacific Ocean radiation contamination? Fucoidan Force® is harvested from wakame seaweed that grows in the Atlantic Ocean. As one of the only manufacturers that only harvests Atlantic-grown seaweed, Fucoidan Force® is one of the few fucoidan supplements that is 100% guaranteed free from the radiation caused by the Fukushima disaster in 2011. Where is Fucoidan Force® made? Fucoidan Force® is made in the USA in a cGMPs FDA approved facility. In August 2002, the FDA created a regulatory standard for ensuring pharmaceutical quality products for human consumption known as the Good Manufacturing Practice (cGMPs). The cGMP initiative ensures appropriate design, monitoring and control of manufacturing processes and facilities. These standards are set to make sure that all products made in the facility meet strict standards set by the new FDA guidelines. Are there any side effects that accompany Fucoidan? Studies have shown that Fucoidan may have blood-thinning properties which could possibly keep your blood from clotting. Always consult a doctor before making changes to your diet, supplements, and medication. People who have allergic reactions to soy can have allergic reactions to Fucoidan. Read more about Fucoidan side effects here. 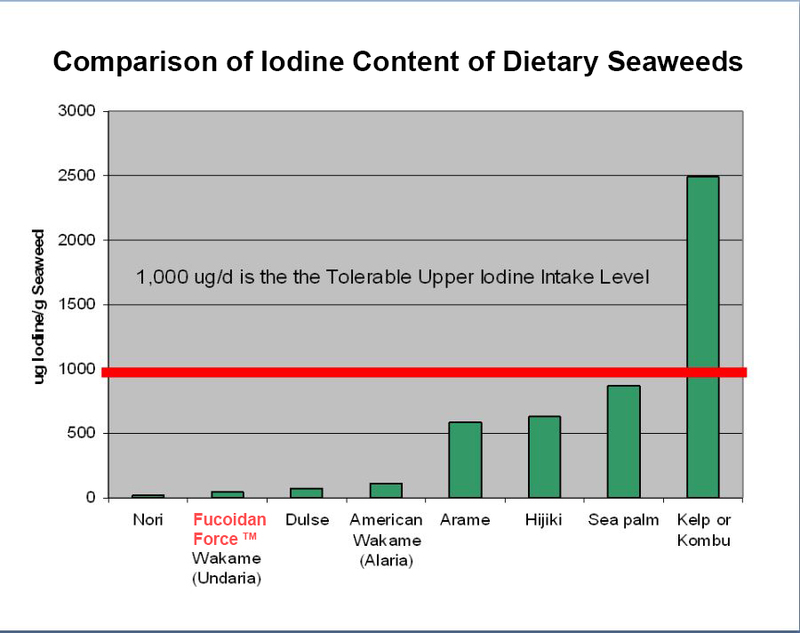 Should I be concerned about the iodine content in Fucoidan Force®? Fucoidan Force® contains 20mcg (micrograms) per gram of product. It uses fucoidan from the wakame seaweed (Undaria pinnatifida) and Sea Kelp (Fucus vesiculosus). There is 300mg of extract in one single capsule of Fucoidan Force® which means each capsule contains 6 mcg of iodine, less than 5% of the recommended daily allowance. The recommended daily value for iodine is 150 mcg, though the U.S. National Academy of Sciences lists the maximum tolerable level of iodine intake as 1.1 mg (1100 mcg) of iodine per day. 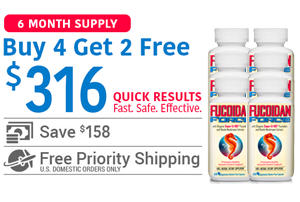 To surpass this amount, you would have to take over 55 capsules of Fucoidan Force® a day. Iodine is necessary for the human body to function properly. Fucoidan Force® provides a small dose of iodine on a daily basis. Always consult with your doctor before making changes to your diet, supplements, or medication. What is the sodium content of Fucoidan Force®? The amount of sodium in the wakame seaweed (Undaria pinnatifida) and Sea Kelp (Fucus vesiculosus) extract used to make Fucoidan Force is approximately 3.5%. Each Fucoidan Force® capsule contains 300mg of Undaria Pinnatifida and Fucus vesiculosus extract. This means you get about 14 mg of sodium per capsule. Keeping in mind that the RDA (recommended daily allowance) of sodium is 2,400 mg, 14 mg is a mere drop in the bucket. Can I take Fucoidan together with other medications? Fucoidan is 100% natural and does not contain harsh chemicals that can cause complications with other chemicals. Because of the blood-thinning properties of fucoidan, you should consult with a licensed physician is always recommended when adjusting medications or supplements. What is the difference between taking a Fucoidan supplement and eating brown seaweed? It takes about 1 kg of brown seaweed to obtain 1 gram of Fucoidan. Since the normal daily dosage of Fucoidan should be about 3 to 6 grams to maintain health and immunity, it would not be logical to eat in excess of 3kg of brown seaweed per day. What is the best time to take Fucoidan Force®? The best time to take Fucoidan Force is in the early morning, late morning, and late afternoon. It can be taken with or without food. Is Fucoidan Force® tested for cesium-137? We don’t test for cesium-137, and we are not aware of anyone that does. We harvest our Fucoidan from the Atlantic ocean, which is clearly stated on our label. For most people, this is more than enough since no one dares put something on their label that is not true for fear of running afoul of the FDA. Is Fucoidan safe for longterm use? Please consult with a doctor before taking it in conjunction with other medications or with other supplements. 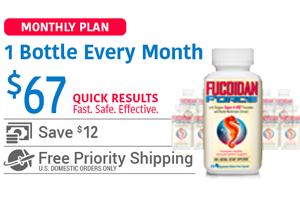 With your doctors approval, Fucoidan Force® may be taken indefinitely to help promote good health, cell-to-cell communication, and tissue maintenance, with no side effects. What research has been done on Fucoidan? Since its discovery in 1913, there have been thousands of studies worldwide on the amazing effects of Fucoidan. Some of these studies can be found in the National Library of Medicine’s PubMed database online.